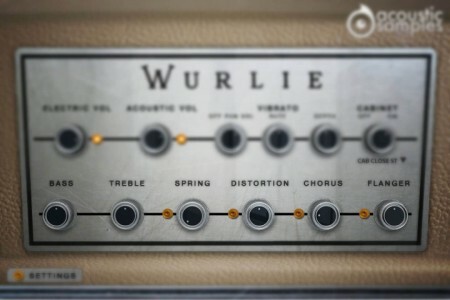 Wurlie is based on e a Wurlitzer 206A model. The Wurlitzer 206A is a student model, and is very similar to a 200A except for its beige color and built in amp/speaker (it also did not come with a tremolo). It was designed to be paired with a 206, which is the teacher model and they were mainly used in conservatories. The teacher had a headphone and microphone to be able to listen to each student individually and talk to them without others hearing them. Once equipped with a DI output and a tremolo system (this is a very common and easy mod with just a few components to solder on the preexisting holes in the original circuit board) the 206A sounds exactactly like a 200A with the exception that it also has a built in amp that is more powerfull and has more bass than the two small front speakers of the 200A's. We recorded the Wurlie from both the direct output using a state of the art DI (Universal Audio Solo 610) and also using a pair of microphones right above the keys next to where the head of a player would be. With our precise resonance model, our detailed staccato and release adjustments and the meticulous velocity layer transitions, the Wurlie is truly the most detailed and accurate recreation of the famous reeds electric piano sound. In the default panel, you have access to many features including the mix of the Acoustic and Electric volumes. The Acoustic volume, if you don't need it, can be loaded/unloaded on the fly by clicking on the yellow led. With the right Acoustic / Electric volume adjustment, you can easily transition from a live sound or to a more inimist sound of you just playing at home with the warmth of the key clicks and sound. The student models don't have the vibrato circuit built in by default, but with a whole system of teacher / student com system designed for quiet music courses instead. There is a common mod for these instruments that consists of adding the vibrato circuit and even add the possibility to control its depth and rate. We added these possibilities and went a step further and added the stereo pan present in Rhodes suitcase instruments. Just like for every mechanical instrument, there are resonances, but in the case of the Wurlie, they are very specific. We captured the sympathetic resonances for both pedal up and pedal down and modelled them carefully to make sure you get the most natural response. Wurlitzers are often played with FX, we added a 2 band EQ, a Spring reverb, a tube distortion, a chorus and a flanger, and there is also a list of known amp simulations to choose from. That's pretty much everything you need to mimic the sound of any Wurlie in any song. You can turn on or off the amp simulation, based on a the real amp of the Wurlitzer (at three different distances), we also added a few other amp simulations like a Mesa Boogie, a fender 210, and a Gibson. You also have the choice to load them in stereo or in mono. - A 2 band EQ with Bass and Treble controls. - We used an IR of a spring reverb to mimic the most used reverb on this kind of instrument. The advenced panel lets you control a few things like the pedal noise or the release volume, and also a few more parameters of the FX. There is also a complete section about the MIDI controls to tweak the response of the Wurlie and match it exactly to how you like it. The Pedal Down Resonance: just like on a real piano, when you play and the pedal is down, the other reeds are vibrating because they are undampened. We recorded that effect that adds realism. 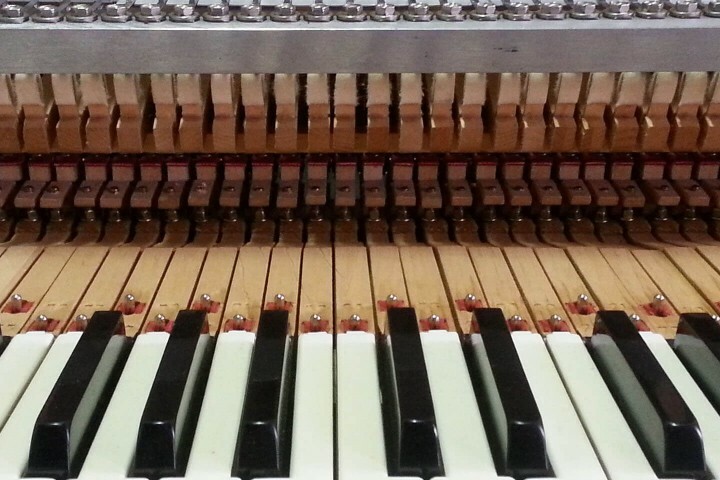 The Sympathetic Resonance: again, on a real piano, when you play a C3 and the C2 key is pressed, the reed of C2 resonates. We sampled that too. The Spring lenght: the spring reverb is as its name suggests, based on a spring and the lenght of the reverb depends on that spring so we figured that modifying its length should be available. The Cabinet Distance: we recorded a few different IRS of the cabinet at different distances that add more or less room to the sound. You can control the Chorus Speed as well as the flanger speed if the default values don't suit your needs. The Velocity Sensitivity changes the volume curve of the library. The Velocity Threshold is simply the minimum velocity that you will have to play to hear a sound. 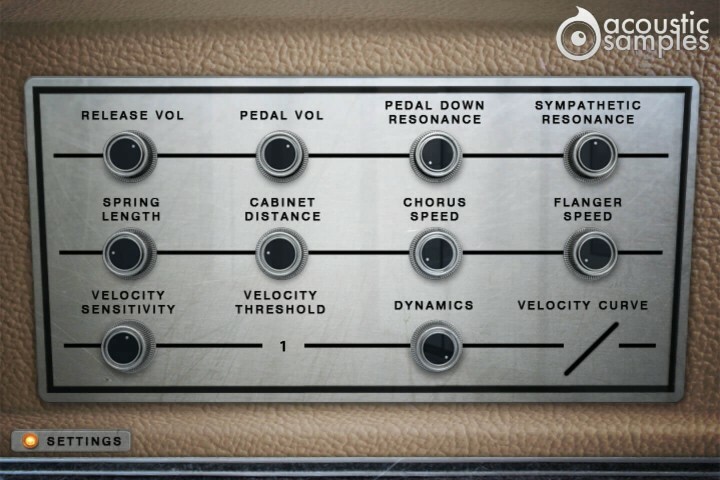 The Dynamics will set the minimum volume for velocity 1 and give you access to all the dynamics that you want. The velocity curve remaps midi input and will give it a concave or convex shape thus changing some sort of a "MIDI sensitivity". 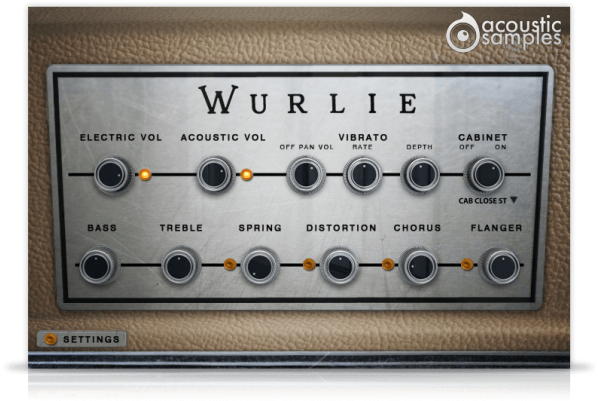 Wurlie comes with its own sample player, the UVI Workstation 3 (requires v3.0.0 or later). I sold my 206a after I got this.